Women tend to adapt to their male spouse when families move. Maria Brandén and Karen Haandrikman examine whether this is also true for the moves couples make when forming a union. 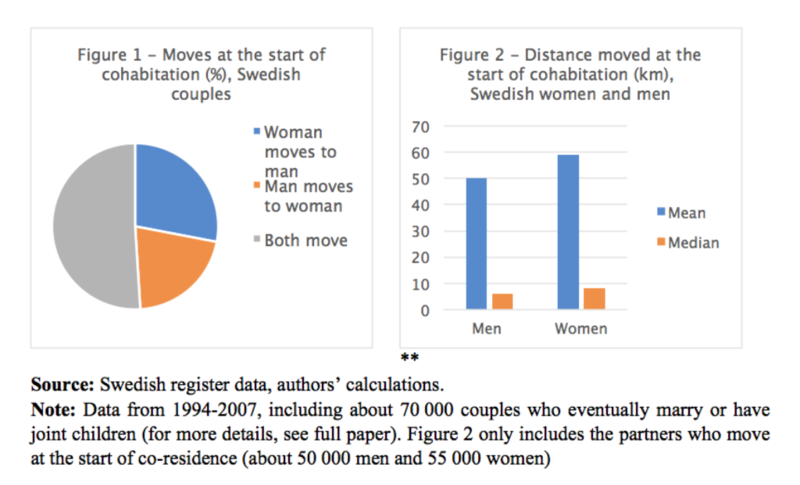 Analyses on Swedish population register data confirm suspicions and show that women more often move to their partner’s home, and move over longer distances, than men do. A large body of research has shown that couples tend to move for the sake of the man’s career rather than the woman’s (Cooke 2008). For instance, moving raises men’s earnings more than women’s (Cooke et al. 2009), couples are more likely to have moved for the sake of the man’s career than for the woman’s (Shihadeh 1991), and when faced with the hypothetical question of their partner being offered a well-paid job in another city, women state more often than men that they would move for their partner’s career (Brandén 2014). Do these gendered patterns also shape the residential mobility that occurs in the process of union formation, at the start of co-residence? In a recent paper (Brandén and Haandrikman 2018), we examined this by focusing on about 70,000 heterosexual couples in Sweden, who started their (married or unmarried) co-residence in the years 1994-2007. We analyzed whether women were more likely to move to where their male partner lived than vice versa, and whether women moved over longer distances than men did. At the start of co-residence, more than half of all unions start in a home that is new for both partners. In 49 percent of all cases, only one partner moves; the woman moves to the man’s home in 28 percent of all cases, while the man moves to the woman’s home 21 percent of the time (Figure 1). When at least one partner moves, either to their partner’s home or to a joint new residence (72 percent of all men and 79 percent of all women), women on average move over substantially longer distances than men do: about 59 kms against 50, and the median distance moved is also slightly higher (8 kms vs 6) (Figure 2). Long-distance migration is likely to have far greater consequences for individuals than short range (residential) mobility. Therefore, we conducted separate analyses for partners who lived close to each other before cohabitation (less than 50 kilometers) and for couples where at least one partner had to move a substantial distance. Overall, we found larger gender differences if couples lived far apart prior to cohabitation (figures 3 and 4). In fact, among couples who lived close to each other before cohabitation, the women and men who moved travelled the same average distance (19 kilometers). Lack of ties or a question of bargaining? There are multiple reasons why these gender differences can emerge. We expected that gender differences in the number and strength of local ties would matter. Local ties, such as ties to family living nearby, owning a house, or having stable employment, are usually stronger for men, as women are typically a few years younger than men when they start cohabiting. Such ties tend to prevent people from moving, or from moving longer distances. However, our study showed that gender differences in moving at cohabitation remained very similar after adjusting for such differences, indicating that they do not explain much of the overall gender differences (figures 3 and 4, comparing Models 1 and 2), especially not when partners lived close to each other before cohabitation. Next, we tested the importance of the fact that the man’s resources within a couple – measured as advantages in age, socio-economic characteristics of the neighborhood, educational level, housing and employment – often outweigh the woman’s. This is synthetically labeled “bargaining power” in figures 3 and 4 (comparing Model 2 to Model 3). Whereas Model 2 controls for compositional differences between women and men at the time they are forming a union, Model 3 adjusts for who in the couple has, for instance, higher or lower income and so on. Indeed, this proved to be of major importance for understanding why women move disproportionally often, and over longer distances, at the start of cohabitation. For partners living close to each other before cohabitation, nearly all gender differences in the likelihood of moving stem from the man’s relative bargaining advantage; for those couples, no gender differences remain after controlling for these advantages. Hence, one key mechanism behind why women seem to adapt more to their men than vice versa is that the man has an advantageous bargaining position, for example, in terms of being more established in the labor market, being older, and having a better housing situation. Men’s relative bargaining advantage is also important if partners lived far apart prior to co-residence. However, for these couples, a substantial share of the gender differences remains unexplained, even after adjusting for this. This remaining excess female likelihood of moving, and their excess distance moved, might be interpreted as indicators of traditional gender norms making the woman adapt more to the man than vice versa. For example, gendered norms regarding women’s and men’s roles in society could make couples consider it to be a larger sacrifice for the man to give up his career by moving than for the woman to do the same. Starting off on the wrong foot? In conclusion, our research adds a new dimension to the family migration literature by suggesting that even at the start of cohabitation couples’ residential decisions are made in favor of the man rather than the woman. We surmise that this initial move, apparently neutral and usually unnoticed, may be more important that it seems, as it could affect women’s social lives and careers, with consequences that may follow them throughout their lives. This is definitely a subject that warrants more attention than it has received until now. Brandén M. (2014). Gender, gender ideology, and couples’ migration decisions. Journal of Family Issues, 35(7), 950–971. Cooke T.J. (2008). Migration in a family way. Population, Space and Place, 14(4), 255–265. Cooke T.J., Boyle, P., Couch, K., and Feijten, P. (2009). A longitudinal analysis of family migration and the gender gap in earnings in the United States and Great Britain. Demography, 46(1), 147–167. Shihadeh E.S. (1991). The prevalence of husband-centered migration: Employment consequences for married mothers. Journal of Marriage and the Family, 53(2), 432–444.